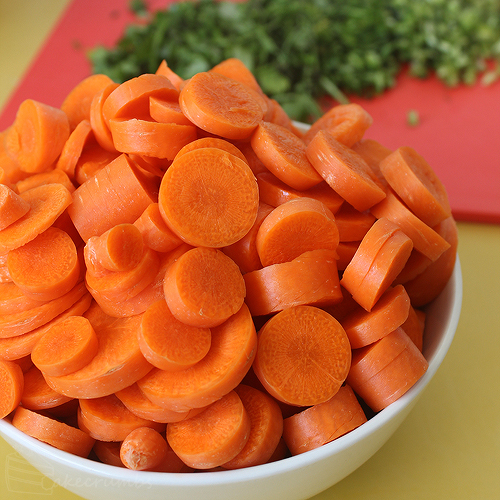 First you’ll want to start off with a bunch of fresh carrot. Rather than peeling the carrot, simply give them a good wash. All the best nutrients live in the skin so it’s better to keep as much of that as you can. I only snip off the tips (and feed them to my Plecos who absolutely love them — waste not want not). Do all your chopping of veggies and measuring of spices first, as it will make the rest of the process seamless. 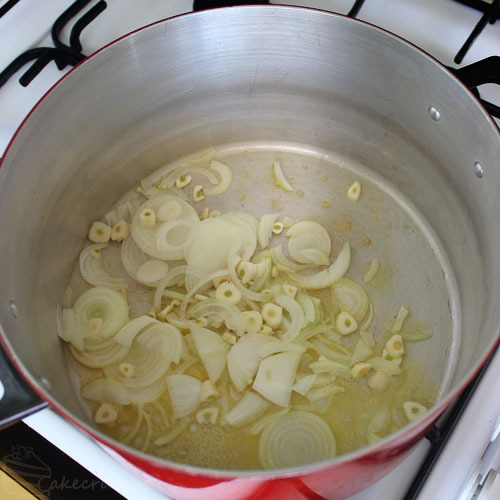 To get your soup going, melt some butter in a large pot and sauté your onion and garlic. 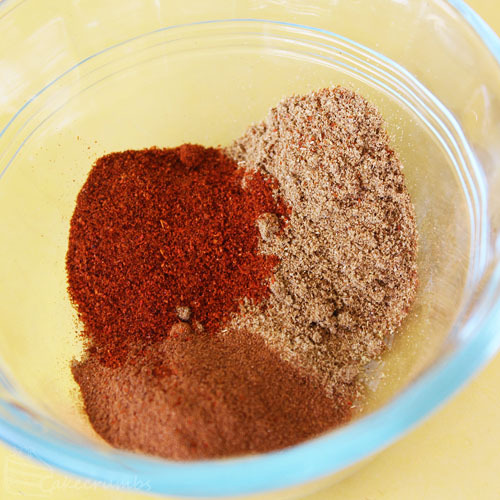 Once it’s soft, you can mix in your spices. If it starts looking like it’s getting too dry you can add a little more butter: you don’t want all those lovely spices burning on the bottom of the pan. 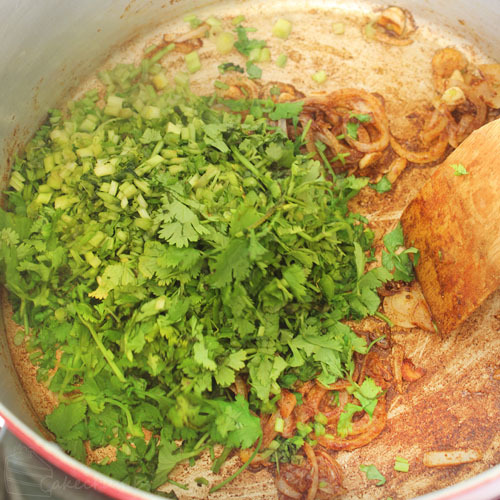 Your kitchen will start to smell amazing, that’s when you know the spices are working their magic and it’s time to add in the fresh coriander. I reserve a little of the leaves to stir into the finished soup later. 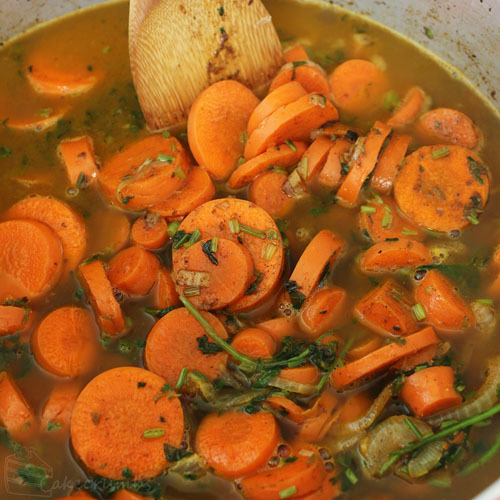 Next, stir in your carrots and let them cook for a moment. It’s then time to add your stock. I alternate between using chicken or vegetable stock based on what I have on hand, or sometimes a combination of both. It really doesn’t seem to affect the taste at all. If you want to keep this dish vego, of course you will not use the chicken stock. Some bought chicken stocks don’t actually contain any real chicken, but I know some people on meatless diets who are still opposed to eating the fake stuff so always check with your recipients first. Bring it to the boil, then reduce to a simmer. They’ll take around half an hour to cook. 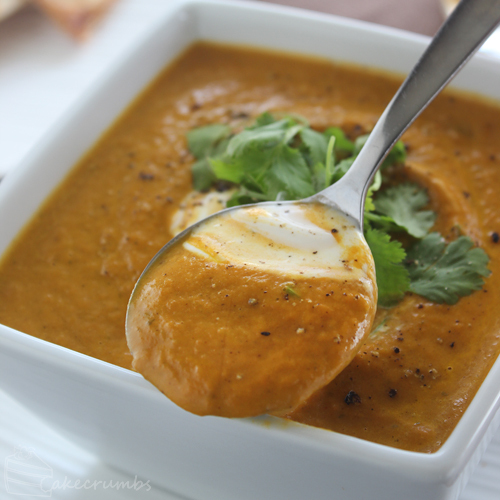 You don’t want to undercook the carrots or you’ll end up with undercooked chunks through your soup, but even more so you do not want to overcook it either. Waterlogged vegetables taste horrid. To check, take a fork and smoosh one of the carrots against the side of the pot. If it’s tender, you’re read to go. To blend soups, I much prefer using a stick blender. I find my food processor misses bits, and it makes a crazy amount of dishes. But do whatever works for you. After blending it up, I stirred in the rest of the coriander leaves I reserved at the start. Here you can add in some cream if you’d like to make it a little extra rich and creamy. I added a little cream into the dish, and then a dollop of greek yoghurt on top. You can flavour the yoghurt if you feel the need to add extra dimension here, but I didn’t this time. If you want to make this dish vegan, you can omit the cream completely or substitute with a dairy-free version. Coconut cream is my preference. I topped it all off with a bit of cracked pepper and even more coriander. Did I mention really really love coriander? We ate this with grilled flatbread, which is our favourite accompaniment. The result is such a flavourful soup we all absolutely loved demolishing. I’ve made it twice already this autumn and the cold weather hasn’t even kicked in yet. 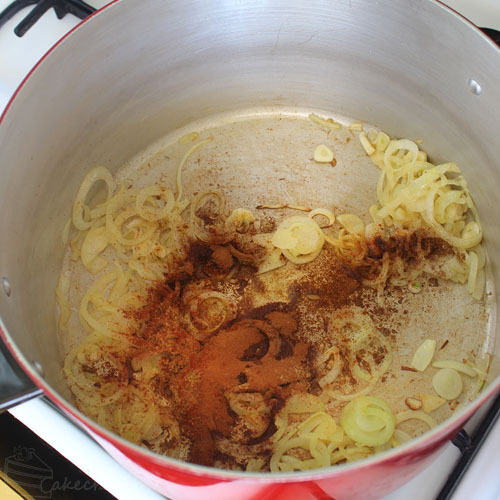 In a large stock pot over medium-high heat, melt the butter; sauté the onion and garlic until softened. Add the spices and stir in; cook for about a minute, or until spices are aromatic. Add in the fresh coriander stems and all but a handful of the leaves. Cook for a further minute. Add the carrot and stir to combine. Cook for another minute, then add the stock. Cover and increase heat to high. Once mixture boils, uncover and reduce to a simmer. 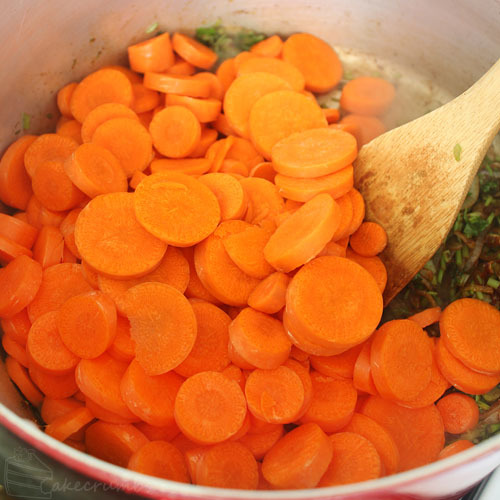 Cook for about 30 minutes, or until carrot is just tender. remove from the heat. Using a stick blender or a food processor, blend mixture until smooth and all cuncks have disappeared. Stir in the reserved coriander leaves (saving a few for garnish if you desire) and the cream if using. 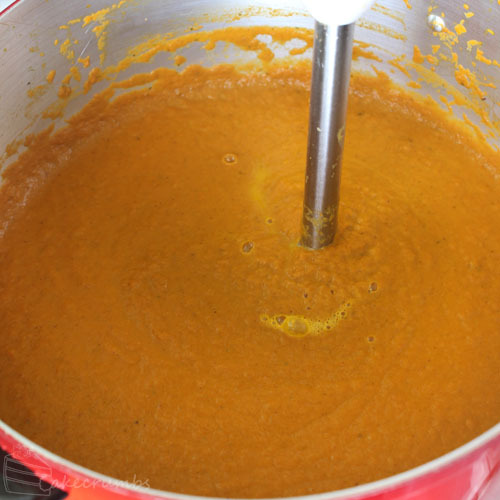 If your soup lost too much heat during this process, return it to a loow heat and stir until soup is hot again. Don;t allow soup to boil. That looks so delicious!! My boyfriend thinks coriander tastes like soap and refuses to add it to anything we make: do you think this has anything to do with the coriander itself or is it just him? (It’s not that we don’t wash up properly :P) OH WISE ONE PLEASE TELL ME THE ANSWER! Haha! That is amazing. I have never heard anyone say it tasted like soap before (and I know plenty of picky eaters). I guess he’s never going to like it then! Damn! Looks like this will be a just for Sez dish, then! I could totally eat the entire pot of it alone. Just sayin’. Coriander only tastes like soap if it’s cooked for too long. If you want to be absolutely sure, don’t add it until just before you blend the soup. I have been wanting to try a coriander salad for so long. I got very close on Christmas: I was preparing the salad to serve with a bunch of other mains and sides, but by the time I’d served everything else there was more than enough food already. I ended up using the coriander for something else. I definitely need to try that! I am allergic to coriander, any thoughts on a substitute? Thanks! 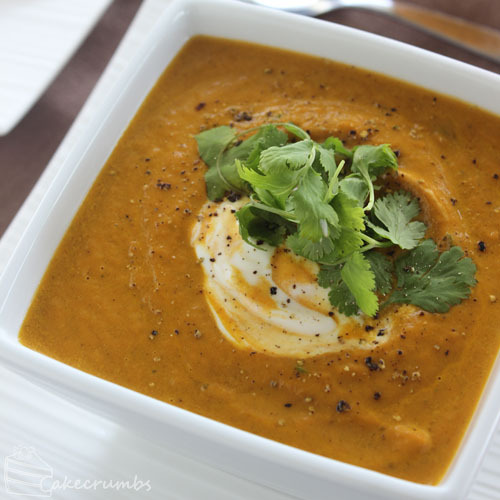 You could just leave out the coriander have a nice enough carrot coup. Any other herb is going to change the flavour, so I’d suggest just sticking to what you like. Parsley is probably close — I’m not entirely sure how it would go with the other flavours though. I made this the same night I read the post and it was delicious! 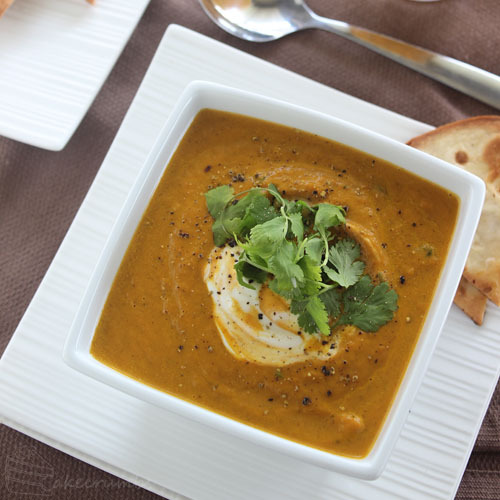 My boyfriend and I love cilantro and having it as one of the main flavors of this soup made it an instant hit. My only problem now is that we’re moving to the summer in the northern hemisphere and soup is far too hot for colorado summers. Really stoked that the weather is cooperating so you can bake again! Oh I’m so glad you all loved it! I’m definitely loving the cooler weather. Though ironically once the weather started getting cooler we had a week of mild weather but constant rain. The humidity in the air caused the fondant on all the cakes I was ‘saving’ to sweat and go limp far worse than the heat ever did. There’s no winning! I made this today. Me and my husband loved it so much! Even the smell of this soup is amazing! The carrot taste is barely inexistent, which is great because my husband hates carrots (and almost any orange or yellow vegetable), and this is a nice way to make him eat some vitamin A.
There’s a wonderful success story! I’ve never heard of anyone disliking carrots before — even my vegetable-hating sister will tolerate carrots. That’s amazing.